A busy night for fire crews in the east. Fire in the Dublin Mountains yesterday evening. FIRE CREWS FROM Dublin and Wicklow were tackling two separate blazes overnight. Residents in Enniskerry and Delgany called the fire brigade after a gorse fire broke out. There were concerns about the safety of some houses in the area if the fire spread. Crews from Greystones and Bray attended the fire regularly throughout the night. It was later declared safe. There are no reports of any homes or property being in danger. 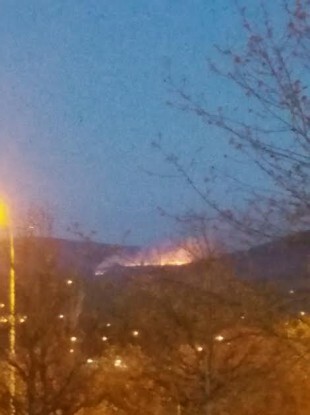 A large gorse fire also broke out on the Dublin Mountains, near Tallaght. The fire appeared to be quite large from the M50. Dublin Fire Brigade attended the scene. The fire later burnt out. Email “Firefighters tackled blazes in Dublin and Wicklow overnight”. Feedback on “Firefighters tackled blazes in Dublin and Wicklow overnight”.